Voting has begun in The Big Craft CarveOff organized by New Belgium Brewing. The Colorado brewery and seven others have put their carving skills on display and consumers may vote for their favorites at Eater.com. New Belgium will donate $5,000 to a charity of the winner’s choice. Voting ends Oct. 15. 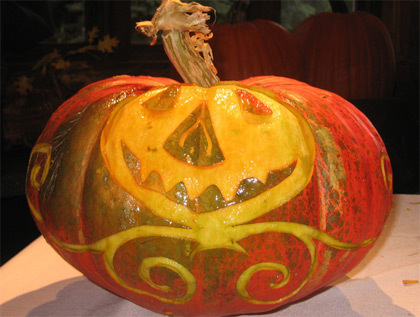 New Belgium’s carved entry celebrates its current seasonal release, Pumpkick Ale. Pumpkick is brewed with cranberries as well as the other ingredients association with pumpkin pies. Other breweries participating in the carving contest include: Dogfish Head Craft Brewery, Brooklyn Brewery, Cigar City Brewing, Cambridge Brewing Company, Jolly Pumpkin Artisan Ales (pictured above), Saint Arnold Brewing and Saint Louis Brewery/Schlafly Beer.